Dr. Ernie Troy Hughes became Truman’s vice president of advancement in August. Having been selected from a national search, Hughes comes to Truman after serving as principal of E. Hughes and Associates LLC, a management consultation firm located in Marietta, Ga., which provides a range of services to help clients understand the cultural underpinnings of philanthropy and the psychology of donors. Hughes’ extensive higher education experience began at the Southern University System in Baton Rouge, La. He first served as a community development specialist, then in the roles of associate vice chancellor for advancement, special assistant to the president and executive director of the system foundation and finally as the vice president for advancement and executive director of the system. 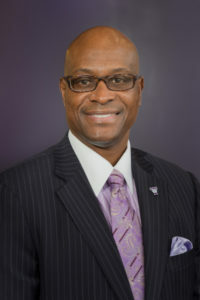 Along with a Ph.D. in human resource development from Louisiana State University, Hughes earned his bachelor’s degree in finance and logistics, as well as his Master of Business Administration, from Mississippi State University. He participated in the Vanderbilt University Higher Education Management Institute, Lilly Family School of Philanthropy and the Thurgood Marshall College Fund Leadership Institute. In addition to the University’s fundraising efforts, Hughes also oversees alumni relations, public relations and publications.